What is Wenda's natural fermented seasoning "Yojo"
It is a product that utilized "natural fermented lactic acid bacteria of the Ueda family" as a seasoning. It was born by co-development with Fukushima Toru chairman "Fukushimaya" and COBO Ueda family. Just like 'Ajinomoto', sprinkle it with your dish Please use it for seasoning and finishing of dishes. The usual dish, umami, sweetness increased, It is finished in a mellow taste. The natural fermented seasoning "Yojo" It is a seasoning of lactic acid bacteria made only with rice and rice koji. Approximately 0.1 g with 3 pretenses. Approximately 750 in 25 g of a bottleYou can use it for your dish. 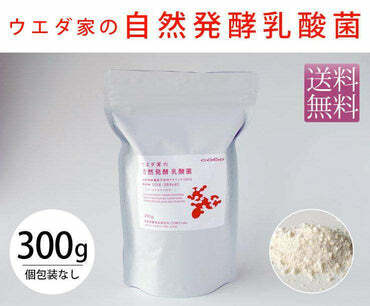 Natural fermented seasoning "Yojo" is lactic acid bacteria grown only from rice and rice koji. You can enjoy it as it is with spoon etc. as it is. I will go into the body quickly. It is a constitution that milk ingredients do not match, but lactic acid bacteria of rice goes into the body quickly. Atopic dermatitis in mother and child Atopic dermatitis in mother and child. I am saved because there are no side effects. * It is an impression of a customer who used natural fermented lactic acid bacteria of the Ueda family. Koji's power is the enzyme produced by Aspergillus. The power of the enzyme is great, if conditions such as temperature and humidity are adjusted, the starch becomes sugar content of the trout in several minutes and several hours, Protein turns into amino acid. Even though we eat hunger in a few hours, this enzyme works in the body, It is because it degrades starch and protein.Yojo was made from rice, rice koji alone, It is a seasoning to bring out the umami of the material. For those who are sensitive to chemicals, those who are in need of allergies, those who are pregnant You can use it with confidence. Special lecturer is Ms. Fukushima Mikiko, wife of "Fukushimaya" president. In a very soft atmosphere, while having fun talking I have lectured on "Yojo" recipe. Mikiko uses this "Yojo" Make your dishes even more comfortable, Do not add extra effort, make things simple It is said that it is being pursued and practiced. "Do not add" "Do not touch" "Do not mix" The idea of ​​pursuing subtraction, When I met the original taste of the material It felt like being in joy. "yojo" and a little salt, soy sauce (using "Fujishimaya's" Kiage ") shallow soak I was able to taste the "taste" of vegetables firmly. What I was most surprised about was the taste. "Apples squeezing juice" and "Mayonnaise" When you compare what you add "Yojo" with what you do not add ... Everyone, "Ah, different" "I am true" etc. The voice of surprise came up. Just adding a little "Yojo" makes the contour of the taste clear More raw material umami is pulled out. I also love "chestnut kinton" With half the usual half of sugar, It is very sweet, there is richness, yet it is not persistent It was a delicious taste. The jam and shallow pickles made with "Yojo" It seems that after about 3 days it will be just right taste. The living lactic acid bacteria draw out the taste gently. As well as everyday meals, as well as New Year's cuisine, I would like to take advantage of the Yoshiro seasoning "Yojo". material · Cucumber ····· 240 g · Carrots 60 g · Salt · · · · · · · · · · · · · 3 g (1% of the weight of vegetables) · Natural fermented seasoning "Yojo" · · 0.3 g · Soy sauce · · · · · · · 1 tablespoonHow to make 1. Cut the cucumber about 1 cm in width and cut the carrots thinly. 2. Cover "1" with "Salt Salt", mix lightly and leave it as it is. 3. When moisture comes out, shake "Yojo" and let it fit. 4. Add soy sauce and mix. Put it in a plastic bag and let it lightly deflate, the taste will adapt quickly. material · Spinach (Komatsuna> · · · 1 bunch · Natural fermented seasoning "Yojo" ·Soy sauce · Bonito · · · · · · · · as appropriateHow to make 1. Mix soy sauce and hot water cooler at a ratio of 2: 1, shake "Yojo" slightly and mix. 2. Wash a bunch of spinach and cut it to length easy to eat. Add 3 tablespoons of 1 tablespoon to 3.2 and add bonito chips. Put the nail of the hawk, put it on fire, let it stop the fire. material · Lotus · · · · · · · · · · · · · · · · · · · Natural fermented seasoning "Yojo" · · 0.5 g · Soy sauce ··········· 50 g · Hawk's nails · · · · · · a little · Inner · · · · · · · · · 2How to make 1. Cut the egg into a size easy to eat, boil it until it gets soft. 2. Boil the potatoes quickly and gradually. 3. Place in a pot, soy sauce and hawk's nails, cook it on fire, boil until medium disappears with medium heat and add "Yojo". Four. Scattering the finish. material Azuki beans ············· 1 kg · Water · · · · · · · · · 2L · Three temperature sugar ······ 500 g · Salt ······ 10 g · Natural fermented seasoning "Yojo" · · 0.5 gHow to make 1. Place the washed red beans and water in a pot and cook until it is soft enough. 2. Add 3 hot sugar, add salt after about 10 minutes, add "Yojo" while moisture remains, boil down and stop the fire. material · Kim Il bean ····· 200 g · Water · · · · · · · · · · · · · · 600 cc · Three temperature sugar ········· 100 g · Salt · · · · · · · · · · · · · 3g · Natural fermented seasoning "Yojo" · · 0.2 gHow to make 1. Place the washed golden beans and water in a pan and cook until it is soft enough. 2. Add sugar, add salt after about 10 minutes, add "Yojo" while moisture remains, boil down and stop the fire. material · Chicken thigh meat ··········· 300 g · Silk tofu · · · · · · · · · · 1 · Chinese cabbage · · · · · · · · · · 1/6 ball · Shiitake mushroom ... 4 ... · Shimeji ····· 1 pack · Enoki mushrooms · · · · · · · · 1 bag · Yarn konnyaku · · · · · · 1 bag · Onion long · · · · · · · · · · 2 · Konbu · · · · · · · · · enemies · Natural fermented seasoning "Yojo" · · 0.3 gHow to make 1. Cut the chicken thigh meat at a size that is easy to eat, and cover "Yojo" for about 30 minutes. 2. Put water in the pot, soak the kombu in it. 3. Cut vegetables, mushrooms, and tofu into pieces that are easy to eat. 4. Boil the chicken under water with boiling water. 5. Put chicken and other ingredients in a second pot and simmer until fire passes. 6. I will get it to Ponzu. Even if you add a Shichigi as you like. material · Prune · · · · · · · · · · · · · · · · 500 g · Granulated sugar ····· 50 g · Balsamic vinegar · · · · 1 teaspoon · Natural fermented seasoning "Yojo" · · 0.5 gHow to make 1. Wash the prunes and cut them in the middle, turn around and take out the seeds, leave the skin with the skin divided into 8 equal pieces. 2. Place prunes and granulated sugar in a pot and keep it until moisture is released. 3. Put a fire on the pan and boil down medium heat to high heat and boil. Four. Add "Yojo" and balsamic vinegar to the finish. material · Egg · · · · · · · · 1 piece · Salt · · · · · · · · · · · · · · · 1/2 teaspoon · Vinegar · · · · · · · · · · 1 tablespoon · Natural fermented seasoning "Yojo" · · 1 g · Olive oil ····· 110 gHow to make 1. Put eggs, "Yojo", vinegar, salt and olive oil in a storage bottle. 2. Stir until it is smooth with a bar mix. It can be stored for about one week in a refrigerator. material · Sweet cooked chestnut · Sweet potato (gold and pot) · · 300 g · Sugar ······ 30 g · Natural fermented seasoning "Yojo" · · 0.5 g · Sweet cooked juice of chestnut · · · · · · · · · · · · · 50g · Mirin · · · · · · · · 1 tablespoon · Salt · · · · · · · a littleHow to make 1. Put the sweet potatoes in round slices, peel off the skin thick, and soak in water for about 30 minutes. 2. Add sweet potatoes to the pot, add water to cover it, boil it quickly. 3. Add water and sweet potatoes to the pot again and cook for 20 minutes until it becomes soft. 4. When it gets soft, crush the sweet potato while it's hot, add the chestnut sweet-cooked juice, sugar and mirin, It slowly kneads up with a low heat. Five.Finally add Yojo and salt, and after further mixing well, add chestnuts of sweet cooked and mix the whole. And using only water as a raw material It is made by long-term natural fermentation in a severe low temperature environment. Growing at low temperature makes bacteria less prone to live, Wild fungi that survived in harsh environments will live together and work together. In this production method, colonies coexisting with lactic acid bacteria and yeast (lactococcus / multipolar budding yeast / extracellular polysaccharide) are born. This colony is the form of lactic acid bacteria, familiar to the intestines of the Japanese people. In the Ueda family, by long-term research, by controlling bacteria by natural selection, We succeeded in stabilizing natural fermentation. (Patent 2014-088640) It was freeze-dried while living lactic acid bacteria colonies (symbiotic) living It is natural fermented lactobacillus of the Ueda family. After packing "Wenda family's natural fermented lactic acid bacteria" in a bottle, it became seasoning of body fat. Little by little, a curing diet. Lactic acid bacteria of rice decide the taste. It's a single person, it's a mellow taste. To pretend to pickles with 2 pretenses. Meat is plump with 3 pretenses. Natural fermented seasoning If you leave it to Yojo lactic acid bacteria, cooking becomes fun. Food ingredients go beyond imagination and taste good. As I continue, the body gets lighter from the intestines. Let's go to the table.